View from the Birdhouse: When did you realize you wanted to be a writer? Kathleen Ernst: I was a voracious reader as a child. When I was about ten I realized that if reading was so much fun, writing my own stories would be even more satisfying. View from the Birdhouse: What was your favorite book as a child? Kathleen Ernst: The Little House books by Laura Ingalls Wilder had a huge influence on me, and helped inspire my lifelong interest in history. They are beautifully written. My 6th Chloe Ellefson mystery, Death on the Prairie, featured all of Laura’s homesites, which was great fun! View from the Birdhouse: What is your writing day like? Do you have any interesting writing quirks? Kathleen Ernst: I balance the actual writing with the business aspects of being a writer—answering email, writing blog posts, etc. I often write in coffee shops. They are noisy, but none of that noise has anything to do with me! I also go on several writing retreats every year. View from the Birdhouse: What was the most surprising thing you learned while creating this book? 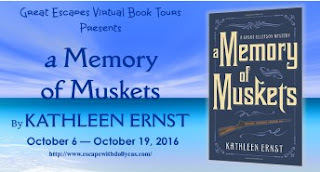 Kathleen Ernst: A subplot features German immigrants who arrive in Wisconsin just before the American Civil War, and I thought a lot about what a difficult situation they faced. Some felt duty-bound to fight for the country that had welcomed them. Others felt compelled to avoid the conflict, and focus on developing their new farm or home. View from the Birdhouse: What is your next writing project? 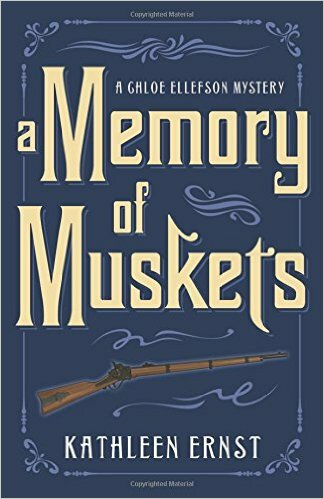 Kathleen Ernst: I’m working on the 8th Chloe Ellefson Mystery, which will feature a new historic site and an ethnic group I haven’t written about before. Coming fall 2017! One lucky reader will win a print copy of Memory of Muskets (U.S. only). This giveaway ends at midnight on October 18. The winner will be notified by email, and will need to respond within 48 hours. The book will be mailed to the winner from the author or her publicist. Sounds like an interesting and intriguing read. Really enjoyed the blurb on the book. It looks most intriguing. Love reading about that era. I really enjoy Civil War reenactments and this book sounds like an interesting read. Love historical fiction. I love this series and can't wait to get my hands on this book! For anyone who has not read this series, I highly recommend it. You will love the history (not only reenacting, but history on immigration). Kathleen knows her history and does the footwork behind her books to be sure it is correct. The characters and plot will engage you and you will not be able to put it down! I am looking forward to her delving into Civil War history in Wisconsin. I had a g-g-grandfather who was in the army then. I haven't read much about the Civil War, but, as I am originally from Wisconsin, I look forward to reading this book. All the previous Chloe books have been fantastic so I am sure this one will be too. It looks like a interesting book. This looks like an interesting read - and I love the interview. This sounds like a great book. My family loves history and I think it's something we could all enjoy. This sounds like an interesting and educational mystery! This sounds so interesting. I'd love the chance to read it! I have not read much about the civil war but I am looking forward to this one. This sounds like a wonderful blend of history and mystery, just my kind of reading material.